Please support the forums and put something in the tip jar! Please report anything you find broken in the Feedback to Admins forum. The Tweed 5E3 PCB is officially depreciated. It has been replaced by the Wattkins Universal PCB which is essentially the same PCB but with many added features. This circuit is modeled after the '59 Fender Tweed Deluxe (5E3) amplifier. Special thanks to Terry Stinger (z_stingray) for the PCB layout. We originally produced a batch of 75 PCBs (which sold out in under a week). We made a second batch of 100 PCBs and those all sold out too. So we ordered some more and those all sold out. Then we realized that we had so many different circuits that would work with the board we should look into making the board more mod friendly. Thus the Wattkins Universal PCB was conceived. The Gerber files for the layout and manufacture of the board will be released under the Creative Commons license. The build thread to discuss the construction, observations, and revelations! R7, R8, C8 and C9 are installed on the chassis mounted components (input jacks and control potentiometers). They are not installed on the circuit board. C15 and R29 are extra components that can be used if you want to cascade the V1 preamp triodes. It was a design request that was able to fit into the board. 22uF is the proper value for C1 when using a 5Y3GT tube rectifier to prevent it from arching. A 47uF cap is recommended for C1 with the Valve Junior conversion since it will use diode rectification, which can take much larger in-rush currents. Valve Junior conversion with standby switch only: The stock chassis mounting screw that goes right above the standby switch is too long and will hit the standby switch when you install the chassis. There is a danger this screw will touch the contacts of the standby switch and connect the B+ to the chassis. You will need to cut the screw down to 5/8" (16mm) or get a shorter one from your local hardware store. You can replace it with a metric Pan Head Phillips M6 x 16 (pitch 1.0) machine screw. OSH sells a bag of two screws for 59 cents (part #9326661). If you are planning on using all four inputs, you'll need the second screw for the hole nearest the top left input jack because that stock screw is also too long. Note for VJ conversion only: the PCB uses most of the existing chassis standoffs so make sure you don't accidentally drill in the wrong place. Only two holes need to be drilled - see picture for details. Print out on legal size paper! Do not "re-size to fit the page" in the print settings! 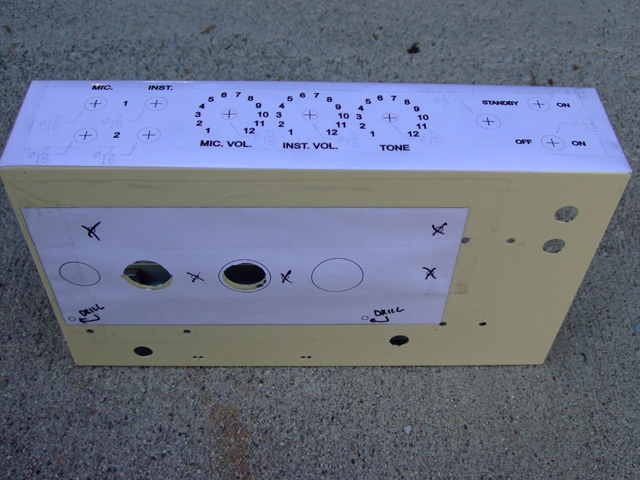 Ready made faceplates for the VJ conversion are available from tubeface.com! The Gerber files can be downloaded here subject to the terms and conditions of the Creative Commons license. A big thanks to everyone in the community that has worked on this project. Special thanks goes out to Z_Stingray of guitaramplifierpcbs.com for the original build plans. jamesrr created the build manual and has made several 6L6 mods including "Pro", "Superlead" and "Bassman". Also gwtekman supplied the schematic with the VVR mods. You are free to share this information, as well as adapt it for your own use providing that you attribute the work to ppwatt.com (which owns the rights to this work). You may also distribute your own adaptation providing that you release it under the exact same license and upload any modifications you make to the 5E3 forums. You may not use this work for commercial purposes, however a license will be available. 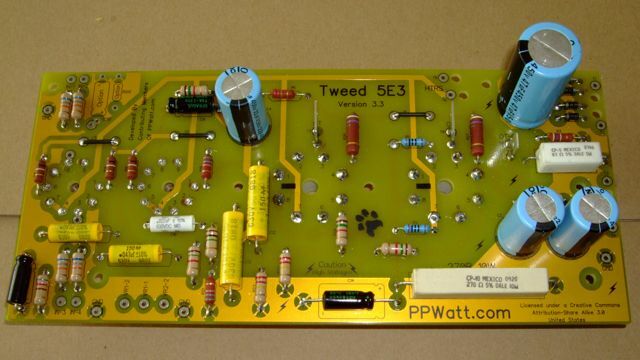 ppwatt.com Tweed 5E3 PCB by Wattkins Amp Forums is licensed under a Creative Commons Attribution-Noncommercial-Share Alike 3.0 United States License. Based on a work at www.ppwatt.com. This site is run by unpaid, volunteer moderators, some of which have commercial interests in the guitar amplification business. They will all attempt to the best of their abilities to not interfere with commercial discussions. All messages on this forum express the views of the author and do not necessarily reflect the opinions of the site and (or) its administrators. This site will not be held responsible for the content of any messages posted on this forum. The operation of this site is supported financially by its members. Copyright © 2007-2018 Wattkins, Inc. All rights reserved.